I spent a couple of nights in Krabi before moving to Ko Phi Phi. There is still alot of rebuilding work going on here after the Tsunami. 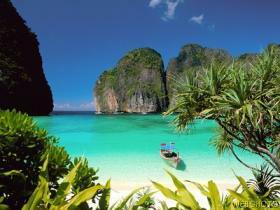 The beaches are great and Phi Phi Lay, which is just a short boat ride away is lovely. I could spend weeks here and not get board! The diving here is also very good, although Im told I was very lucky to get such good conditions.